Mountains have held a spiritual significance across cultures and different philosophies from the beginning of human existence. In the Old Testament Moses climbed Mount Sinai to speak to God; Greek and Hindu Gods are believed to have resided on top of mountains. It was as if the mountains were our stairway to the heavens, bridging the mortal world with that of the Gods. Ascending a mountain became a spiritual quest, a journey to look within and connect to the divine. Yes….I was here to pay respect to a mountain. When my friend and fellow International student Carlos, the mountain man from Latvia, asked me one day in his heavy eastern European accent “So Thomas you vant to climb Song Shan?” I immediately said yes. Carlos was one of the most interesting characters I have ever met. He was straight out of the woods in his demeanor, tone and tall with a lean body, and a shaved head with a long, thin beard extending from his chin. His accent in speaking English utilized the V’s versus the W’s like Drago from the movie Rocky IV which made everything sound so dramatic. After dinner each evening he would wait impatiently each evening to get street food from a village food cart. His food of choice he called a pancake, a homemade, doughy wrap filled with his favorite grilled meats. He would call out every evening…”I vant a pancake…Is the pancake guy on the street?” Carlos had been at Shaolin for over 3 months and had trained hard. He was a fighter back home and was a warrior at heart. But at his depth, at his core he was a mountain man. He was always out exploring the mountains, mostly alone, as this was his home. 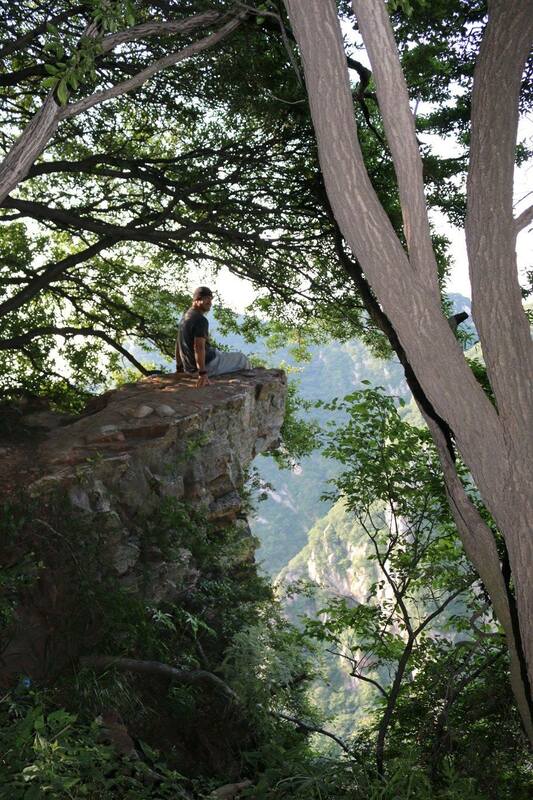 He was always anxious to show others his home in the mountains hoping they could experience his love and connection to nature and the outdoors. Carlos told me he grew up in the country in Latvia and as a child would run around naked with his brothers in the woods. He said he knew all the plants and the trees in his country. His idea of fun back home was to hike into the snow laced woods with his friends carrying a kettle bell, where they would train deep into the night, then build a huge fire and then gorge on a post workout feast. Carlos had recently bought a 4 person tent so he could stay on the mountain versus hiking up and down on his days off. Asbjorn the Viking monk and I were to be his first disciples in camping on Song Shan. 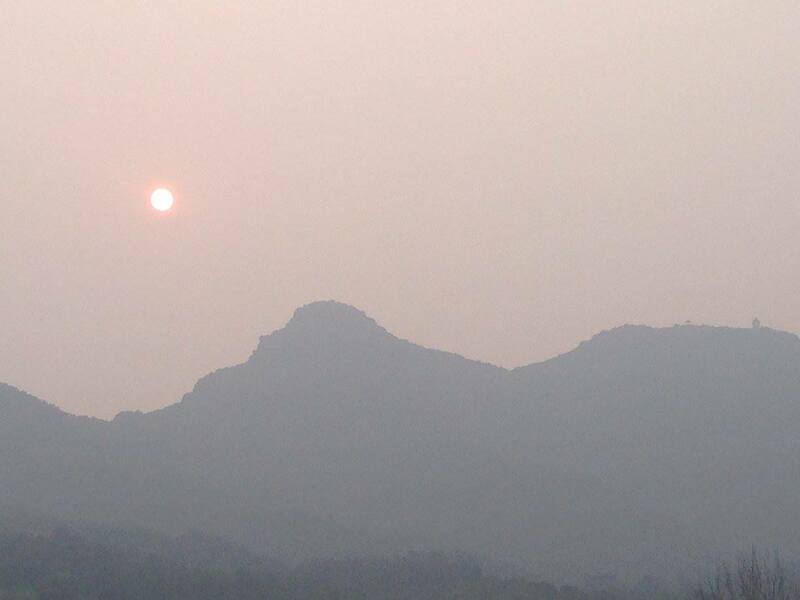 This was a golden opportunity for me as one of my primary objectives was to experience Song Shan mountain. Since our only real day off from training was Sunday we planned to leave on the hike to the top of Mt Song early in the afternoon on Saturday after our morning training, then spend the night and return Sunday evening. be a conditioning session in running up the mountain to Damo Cave. I was both excited and hesitant about this. 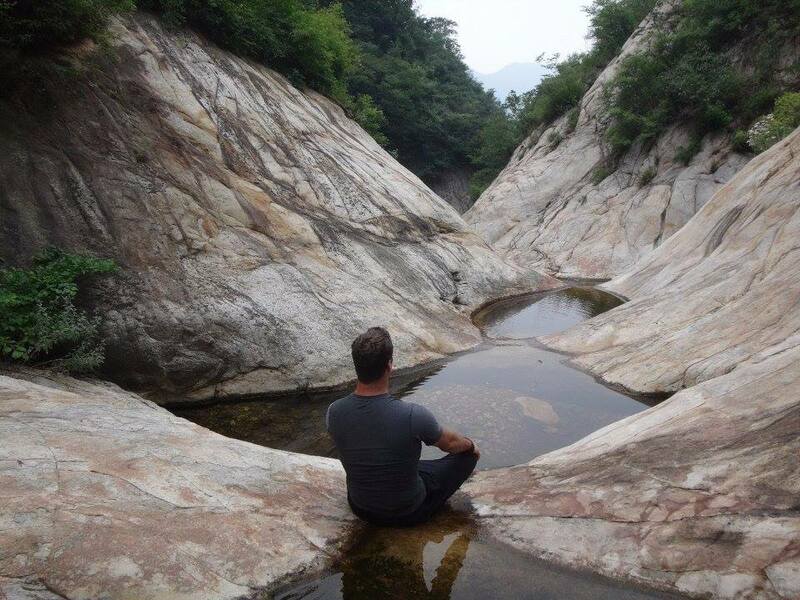 Excited as I want to see and experience the spot Damo sat and meditated for 9 years when he first arrived at the Shaolin Temple from India, and hesitant in climbing 1300+ steps straight up in the 95 degree heat and humidity. Our core group of six headed out in the morning from the Shaolin temple onto a rock lined path toward the Damo cave and statue. We made our way past a small, open temple along the way and started our run up the hill. At first, it didn’t seem bad, slow and steady and then the stairs appeared. Stone stairs as far as the eye could see straight up. Po from Kung Fu Panda came to my mind when he said he was up against his greatest enemy “stairs.” I fully understood. There’s something about climbing a mountain as the mind has desire and will to ascend and rise within so that we can become the best that we can be; yet, there’s doubt and fear that creep in like anything in life that make us hesitant and small. The pain that we endured in climbing to the top fought with the desire to complete the task and experience the Damo cave. We ran, we walked, as we ascended one step at a time. The eternal question in climbing – How do you climb a mountain? One step at a time. Step after step we kept going, past the tents covering the path filled with old t-shirts and trinkets. I was too out of breath to dwell on this irony of shops filled with trinkets and t-shirts along the path to Damo Cave where Bodhidharma let everything go in meditation. Finally we made it to the top and I stopped to peer into Damo’s cave. There was an older nun managing the site to ensure no one entered or damaged the sacred spot. My tiredness dissipated in the reverence of the moment. This was the spot that the founder of Zen and modern day martial arts sat for nine years and found enlightenment. 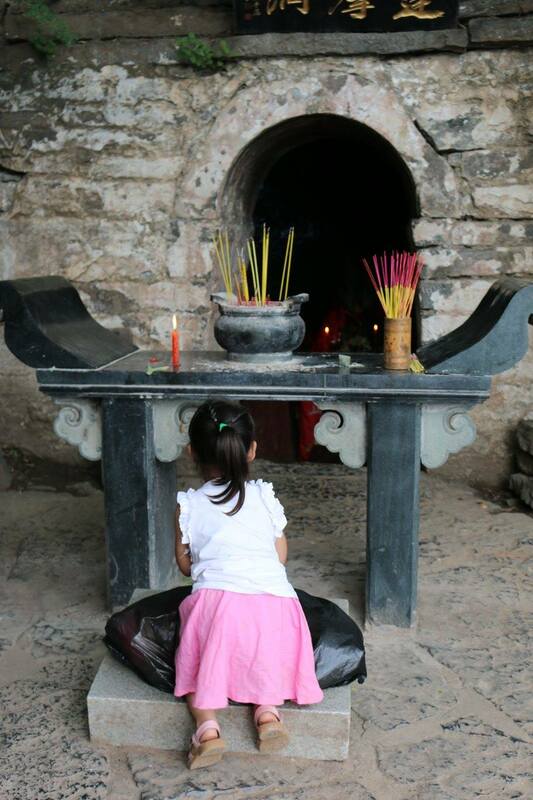 Outside of the cave entrance was a small stone table set up to light incense and bow in respect. I watched a mother and her two daughters kneel one by one and bow in respect to Damo. Then the youngest daughter who couldn’t have been more than 6 or 7 went back to bow again. This moment I will always treasure, it moved my mind past the pain and reflections of Damo and his experiences from 2000 years ago to one of innocence and love. 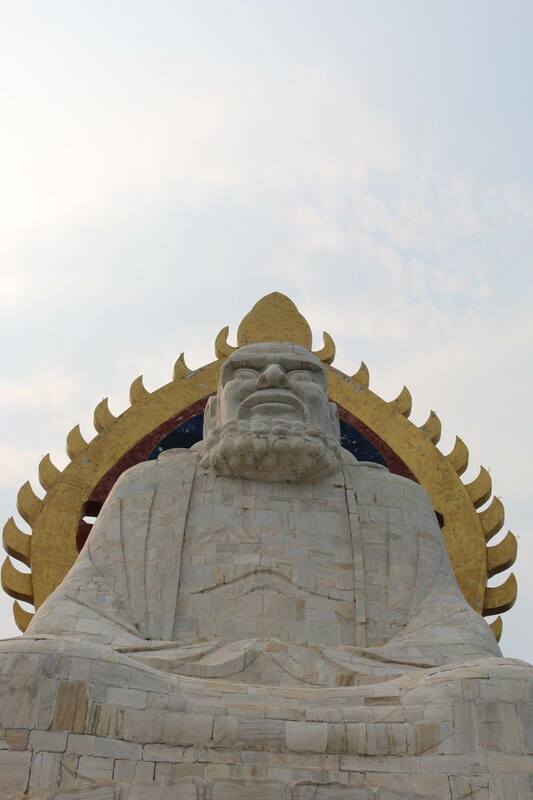 Our crew climbed a bit further to the top of the mountain to sit underneath the 35 foot high statue of Damo. 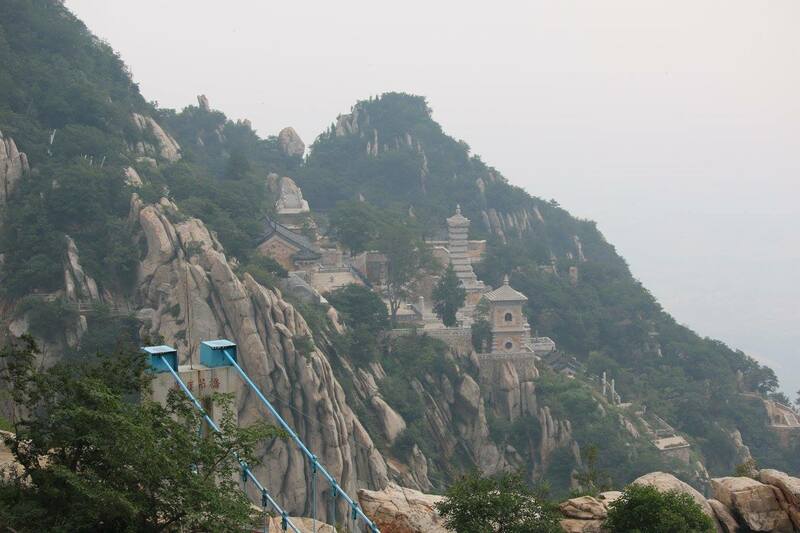 From here we could see the full valley below, the Shaolin Temple, our Kung Fu village and across the other side Mount Song Shan. This was going to be my afternoon. Climb one mountain in the morning and another in the afternoon. Our crew ran down the mountain finished our training and headed back to our hostel for lunch. Our plan was to eat and rest an hour and then head out on our 5+ hour hike up to the top of Mt. Song. I was exhausted from the morning training, I hadn’t drank enough water and my head was pounding, clearly dehydrated. I pounded down some water and tried to shake it off. I didn’t want to miss this opportunity but climbing a mountain with a throbbing head ache wasn’t going to be pleasurable. I took a nap and still the headache wouldn’t go away. The Viking monk woke me and told me we had to go. I was about to cancel but I knew I needed to honor my word. I had committed to this and this I knew was an opportunity I couldn’t pass up. I was willing to take it on no matter the outcome. I had 5 minutes to pack which wasn’t difficult as I only had a small pack used for my laptop. I had no sleeping bag and my blanket wouldn’t fit in the bag. I threw in a towel for a blanket, a coat, a hat and some long pants along with some water and snacks. This would have to do. Yet, this was not my norm. Back home in Seattle I hike and climb mountains and I make a point to have the proper gear and supplies. This was my first overnight trip not having the appropriate gear. I was willing to deal with the consequences in exchange for the experience. We set out from the hostel and walked a couple hundred meters down the path and then veered left onto a dirt path that meandered through some farm fields. I was wearing shorts, my hiking shoes and a t-shirt as it was still extremely hot. “Vatch for snakes as they are all over this mountain.” Carlos said again. Gulp was my only response and my head was now on a swivel. Carlos and Asbjorn both were wearing their long Kung Fu pants and socks. I had made a mistake in not following suit. After a short while we veered left and began our ascent. Just over our head was a tram that most of the tourists took mid-way up the mountain to a temple and scenic view spot. From here they could choose if they wanted to climb further up the mountain. “Hey, why don’t we catch the tram up the mountain to save some time?” Both Asbjorn and I asked. “I don’t vant to spend the money or wait in the line,” Carlos said. Asbjorn and I looked at each other, the cost of the tram was about 20 Yuan, roughly $4 American dollars. $4 dollars to save us two hours of climbing, seemed like a logical and easy decision in particular since we had already climbed another mountain earlier in the morning. Carlos wasn’t having it so we kept climbing and after two hours snaking up the mountain we made it to the tram drop spot and temple location. This was a tourist hot spot with drinks and trinkets being sold. The Viking monk and I both overspent on a cold drink but it was worth it. We rested a short bit and kept climbing. As usual we were the target of the Chinese tourist’s cameras. Indifferent to this we kept climbing a small path along the side of the mountain and just after the temple the views became spectacular along the granite cliffs. Slight metal bars kept hikers from a thousand foot fall. “Vhen it rains, tourists die up here all the time.” Carlos called out. “Come again,” I said. My heart beating already as I was not fond of heights. “The granite gets vet and they slip and fall off the mountain.” He said without emotion. I nodded and just kept climbing. I was profoundly happy it was dry this day and waited to see what was next. It didn’t take long for me to see. The path wound around to the edge of a granite cliff where indiscreet steps had been carved into the ridge in order for us to keep ascending. Alongside were chains pounded into the granite to hold onto so as not to fall the one way trip off the edge. I understood now why not to climb this in the rain. Again I battled this incredible view and experience with the fear in looking off the edge. A bad step or a slip and we would tumble off the mountain. The only approach was to set the eyes forward, and focus on one step at a time. Asbjorn and I became quiet in our concentration at this point in the climb. Having not been up here before I was uncertain in how much worse it was going to become. Asbjorn had done very little hiking and no climbing at all. I could only image what was going through his mind. The higher we got on the climb the less day hikers we found. Most stopped at the temple, and the few that continued didn’t follow the trail very far. After about 3-4 hours into our climb we were on our own. The granite cliffs thankfully shifted into a tree lined path with little to no view other than the path in front of us. We occasionally had to relay our packs ahead to the guy in front of us as we free climbed up a rock face, yet overall it was just a tedious, uneventful path. Finally after about 5 hours we climbed to the crest of the hill we were on and Carlos announced our arrival at the top of Song Shan Mountain. This event was without ceremony as there was no view, and this sacred spot was sprayed with litter as had the entire path up the mountain. I was without words, I was tired, my head still hurt and I was hungry. 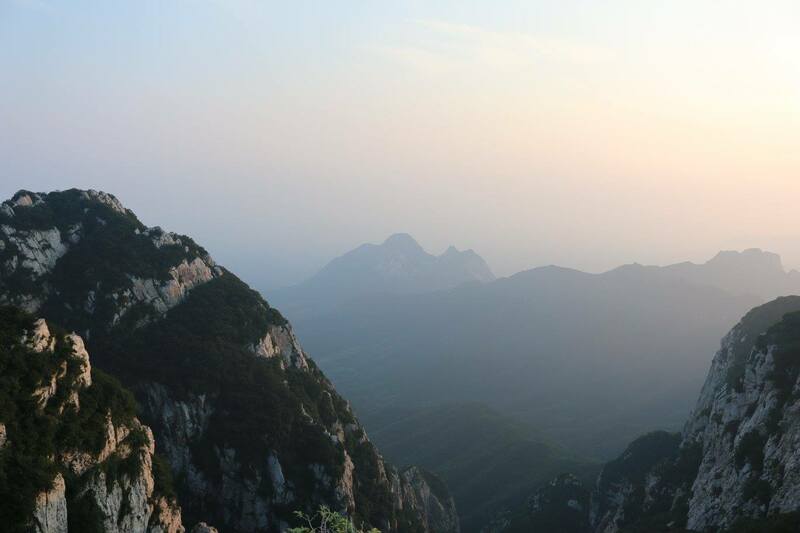 It’s been said that the root of suffering is expectation and this is where I was at as I had built in my mind what this experience would be like at the top of one of China’s 5 sacred peaks, and here I stood on a hill with some trees and garbage. “Let’s set up camp, and I vant to show you one of my favorite spots.” Carlos called out. other side of the mountain and then back up to the edge of a cliff overlooking the other side of Song Shan. We were about an hour from sunset and as we came into view of the opening my heart opened and wept. All of the pain, and suffering and expectation washed away as I sat in one of the most beautiful spots I have ever seen. We sat in silence, as if to bow to the sacredness of this spot. We didn’t need words, the wind blew, the birds sang and the sun kissed the sky and the day goodbye. Sometimes in life we must experience pain so that we have gratitude for the beautiful moments in life, and this was one of those times. We must see darkness for us to see light. All I could see was light through the impending darkness. This moment was our reward for pain, and for our persistence. After the sunset we made our way back to camp and built a huge fire. I was exhausted after this long day and after a small meal laid down in our tent. In getting in the tent it was clear this was NOT a four man tent. Back in the States this was a two man tent, and the three of us were not exactly small, so combined with not having a sleeping bag I knew this was going to be a long night. Even in the middle of summer, the tops of mountains bring in a chill. There was no way around this. I put on my pants, my coat, hat and wrapped myself in my towel. I had never been so underprepared for a camping trip. However, it would have to do. Eventually the guys made their way into the tent and we went head to toe, head to toe with the Viking monk as the sandwich in the middle. He was the only one with a sleeping bag so it was a chance for Carlos and I to try and find a little warmth. With the three of us in the tent there was no room to move. Rolling over took place by spinning in place on one spot.The ground was hard and the thin yoga mat I was using provided little comfort. I knew right away I would not sleep much. Throughout the night, I could hear Carlos try to adjust and get warmth just as I was on the other end of the tent. The Viking monk in his sleeping bag and Norwegian dreams slept through it all, content with his red beard sticking into the air beneath long exhales and an occasionally snore. Morning couldn’t come fast enough. We ate a quick snack and decided to try a different route to the Kung Fu village. Down we went, ridge after ridge, combined with a few attempts in traversing a dry creek bed (failed), trying to find the lost path (multiple fails), a huge snake crossing directly in front of Carlos (almost major fail), a few ledges overlooking astonishing cliffs and then finally finding our way home. After a replenishing lunch all I could think about was gratitude. Gratitude for Carlos the mountain man and his willingness to take us on this journey. Gratitude for going in the face of not wanting to and gratitude in connecting to the beauty in nature. I reflected on the sacredness of this place. This energy is created by our experience and could be anywhere we declare it. Anatoli Boukreev declared “mountains are the cathedrals where I practice my religion.” Yes, I understood. It was in the solitude, in the wind, in the sounds and sights of nature that we feel the sacredness. It was here that we connected to the divine within. It was here that we connected to the divine in everything. 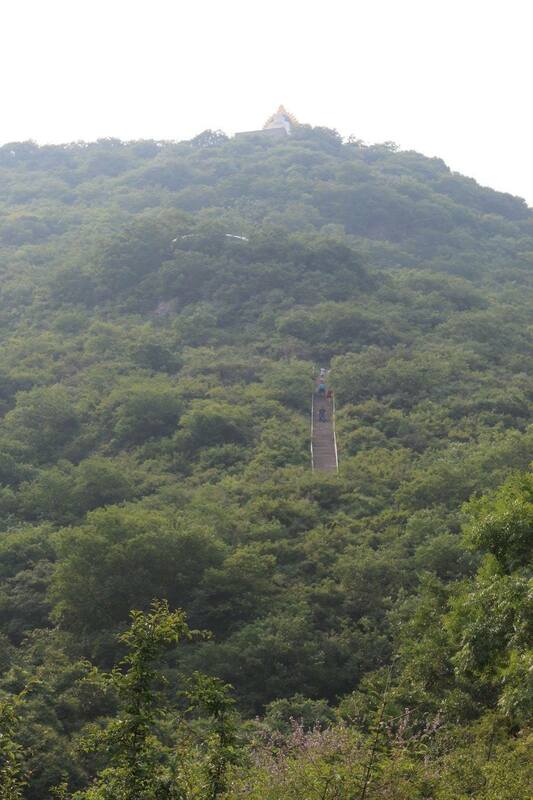 This was the sacredness of Song Shan. I had heard about a hike up to a suspension bridge and the Song Shan Diaogiao temple and knew I needed climb this before I left China. Again, my source for all hiking was Carlos the mountain man. “Of course you should go, this is a beautiful hike. You vill vant to go in the evening so you can sneak past the fence on the bridge as they are doing construction at the temple.” He said. I wasn’t sure about sneaking under/over a fence on a suspension bridge but he assured me it was a hike I needed to take. 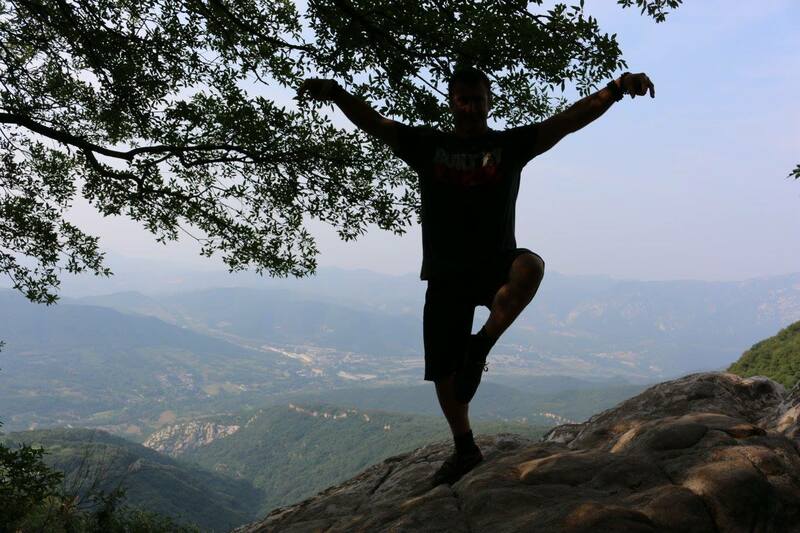 I trained in the morning at the temple, quickly ate lunch and headed out on the hike with the plan to skip the afternoon Kung Fu training session. I needed to get in this hike before I left. Getting to the trailhead was not as simple as it seemed. All of the buses into Shaolin seemed to stop at the temple and the Pagoda forest and you were left on your own to get to where you needed. Occasionally a small cart using a motorcycle engine acted as a taxi around the village, however, for this hike I headed out on my own. It was roughly 2 km up to the trailhead and then a significant hike from there. On the way up I noticed some construction on a tram that was either being built or getting updated that would eventually take the tourists up most of the hike on the mountain. This seemed cheating to me. When you get to the top of a mountain you want to know you experienced all that it had to offer, every step. In this, through the pain you could then be at peace to enjoy every moment as if it were earned. I started my journey up the trailhead, past some locals selling herbs from the nearby forest and quickly came to a familiar presence – stairs. These steps didn’t seem to stop ascending as far as my eyes could see. There were so many that I decided to play a game and count them. I was hiking on my own so this would be my mental game to take my mind away from the hike as I was already tired from the morning training. Up and up the stairs went. It gave me time to reflect on the amount of effort it must have taken to put in every one of these stone steps. 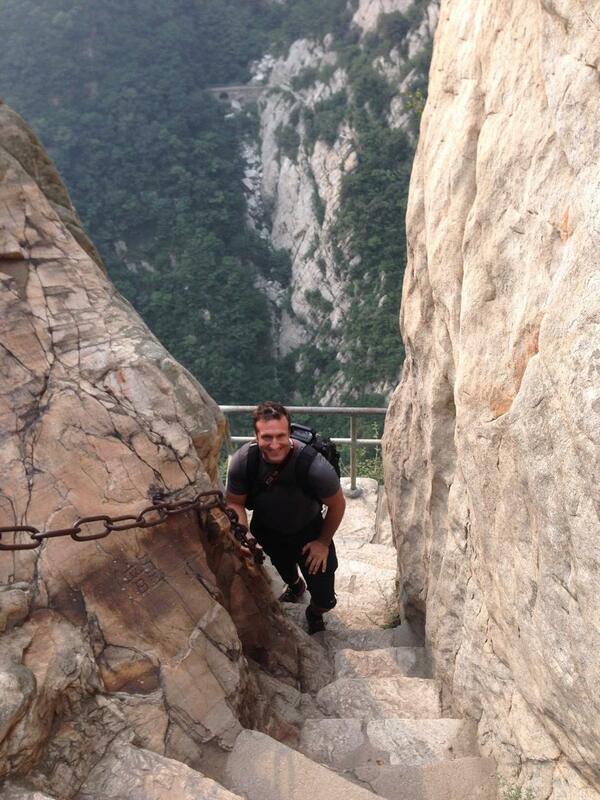 The effort was monumental and on just about every hike I went on in China. Truly astounding. Then about half way up the first set of steep stairs I came across a lady with a small, homemade broom cleaning the trail and emptying the garbage from the cans along the trail. This was her job. I kept moving up the stairs until finally on a count near 1000 the trail reached a tree lined, shady section along a creek and continued on an incline into the mountains. stairs in what was next on the path. 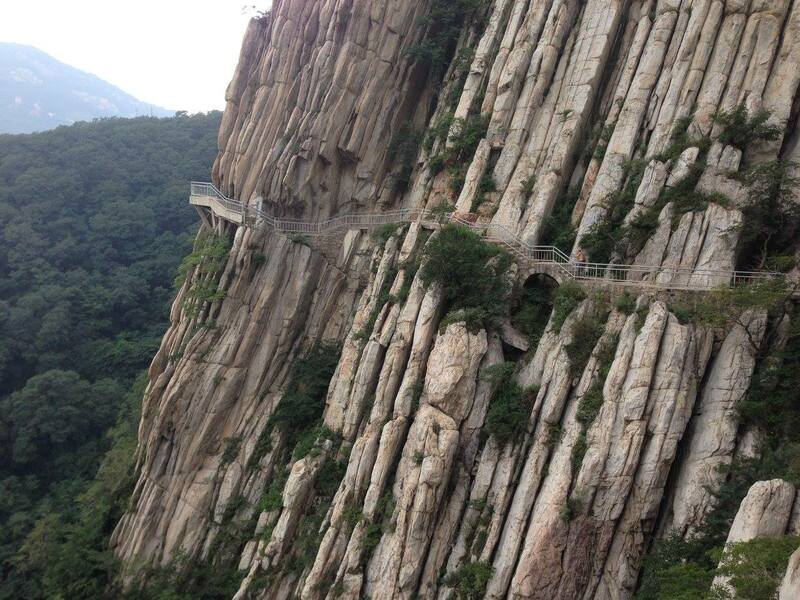 The manmade path mirrored the ridge line in and around the mountain ledges making a huge semi-circle, followed by more stairs up, a few tight squeezes on the granite with chain railing until finally you could see the suspension bridge and temple off in the distance. I made my way up the final steps (4000 up and 4000 down total) until I stood on the suspension bridge hovering in the air over hundreds of feet between granite cliffs. All that was left was the simplicity of a stone temple, built high into the side of a mountain to find peace and connection to the God within. Mountains require discipline, effort. They require persistence in the face of no hope. They require one to transcend something within themselves to overcome what they thought was not possible. The spiritual connection in climbing a mountain is the same path. Persistence, self-discipline, having to overcome something within to find beauty and love along the journey. William Blake stated “Great things are done when mountains and men meet.” It is in nature and the mountains that bring out the best in us, the ability to overcome and keep ascending forward. “Thomas, I have to show you 5 Dragon Pond before you go.” Carlos tells me on my last day in China. 5 Dragon Pond was a secluded spot with five small ponds surrounded by granite walls that many famous pictures had been taken of the Shaolin monks. Carlos told us it was a must see so myself and the core International crew of Kong, Erika, Asbjorn, Suthan followed our Latvian guide out of the Kung Fu village and after a few kilometers and a small hill we took a left onto a little used trail and scrambled down a small hillside. At the end of the trail was a small, discreet pond littered with plastic bottles and garbage. It left our party with no inspiration. “This can’t be the spot,” I said out loud. “Vait till you get up on the next pond,” Carlos assured us. The quickest way up was a small swim followed by a slight rock climb with bare feet. We made it up and true to the word of Carlos this pond was bigger and the granite walls were rich in color, enclosing the small creek and the 5 ponds in a mirror. The water was still and reflected all of the colors leaving breathtaking pictures. 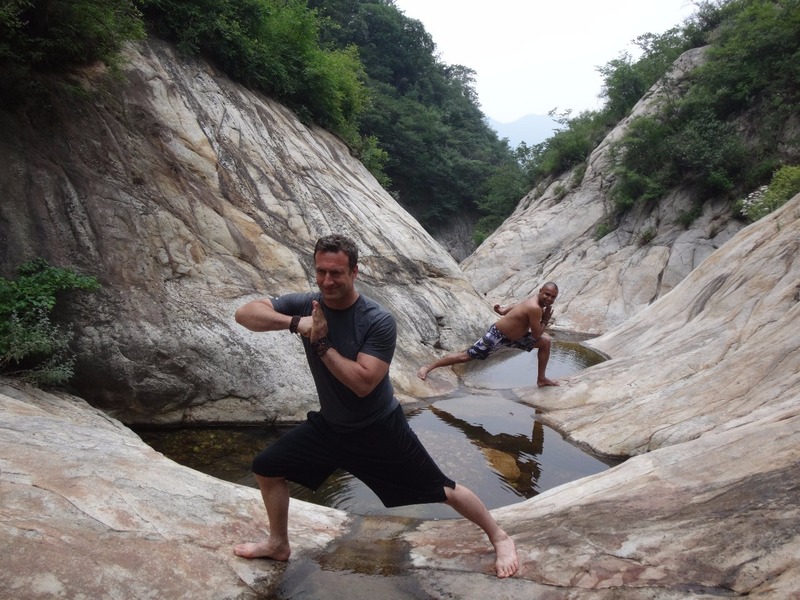 We all put on our best Shaolin monk poses and took in the moment. This was my last activity before leaving China and it left me with a memory of reflection, of the beauty in nature and of friendship. We represented the Netherlands, Norway, Latvia, Thailand, Australia and the United States on this hike yet for this moment, this trip and now for this lifetime we are all brothers and sisters having shared these experiences. Life is the journey, it is the experiences. It is up to us to seek them and to experience life to the fullest, on the edge.